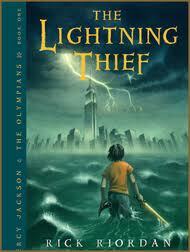 reading The Lightning Thief by Rick Riordan. they have to do with the camp? Underworld? What other feelings does he have about his assignment? 5. What clues do Percy and his friends have that all is not right with “Auntie Em”? Why do you think they overlook the clues? things does he discover about himself? in the novel? In Greek mythology? 10. When Percy finally meets his father, Poseidon seems distant and hard to read. making some lame excuse for not being around.” Do you agree with Percy? resolved by the end of the story? father and her stepfamily. Do you think they will all get along better now? Why? Why not? What do you predict will happen? 14. In the end of the book, do you sympathize at all with Luke’s feelings of betrayal? Is there anything you can relate to about his point of view? be attention problems enable him to be aware of all sides of attack during a battle. While he struggles to read English, he masters ancient Greek almost effortlessly. today have been successful in a different moment in history?